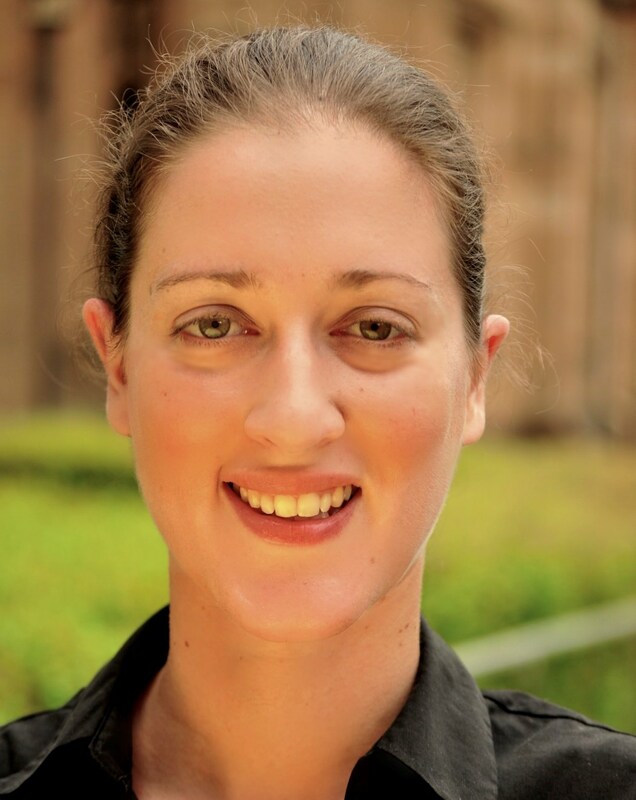 On behalf of the ChemComm Editorial Board, we are delighted to announce Elizabeth New from the University of Sydney, Australia, as the winner of the 2017 ChemComm Emerging Investigator Lectureship – congratulations, Liz! Liz finished her BSc (Advanced, Hons 1 and Medal) and MSc in Chemistry at the University of Sydney before embarking on a PhD programme at Durham University, UK, working with Professor David Parker. After being awarded her PhD in Chemistry in January, 2010, she was a Royal Commission for the Exhibition of 1851 Postdoctoral Fellow at the University of California at Berkeley within the group of Professor Christopher Chang. She then returned to the University of Sydney as an ARC DECRA Fellow to start her independent research career in 2012, establishing herself at the cutting-edge of molecular imaging and developing novel chemical imaging tools to supplement existing imaging platforms. She developed the first set of reversible sensors for cellular redox environment containing flavins as the sensing group, including the first examples of ratiometric reversible cytoplasmic sensing, reversible mitochondrial sensing, and ratiometric mitochondrial sensing. She has also developed the first fluorescent sensor for a platinum metabolite, enabling the unprecedented visualisation of cisplatin metabolism, and a subsequent sensor to study the metabolism of transplatin analogues. Her research group is one of the very few in the world to be investigating cobalt complexes as responsive magnetic resonance contrast agents, and she has developed new methods for ratiometric fluorescent sensing, as well as new strategies to control subcellular targeting. Her research excellence has been recognised by a number of awards, among them the NSW Early Career Researcher of the Year (2016) and the Asian Biological Inorganic Chemistry Early Career Researcher Award (2014). Passionate about communicating science, she has spoken about her research to high school students (as the Royal Australian Chemical Institute (RACI) Nyholm Youth Lecturer, 2014-5, and the RACI Tasmanian Youth Lecturer, 2017), to the general public (as a NSW Young Tall Poppy Awardee, 2015), and to politicians and policy-makers (as elected executive member of the Australian Academy of Science’s Early-Mid Career Researcher Forum). 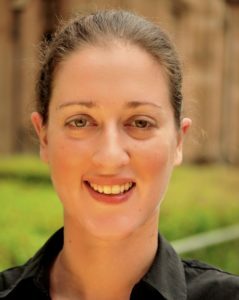 She is currently a Senior Lecturer and Westpac Research Fellow in the School of Chemistry at the University of Sydney, where her group continues to focus on the development of molecular probes for the study of biological systems. As part of the Lectureship, Elizabeth will present a lecture at three locations over the coming year, with at least one of these events taking place at an international conference, where she will be formally presented with her Emerging Investigator Lectureship certificate. 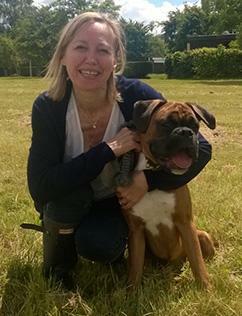 Details of her lectures will be announced in due course – keep an eye on the blog for details. The annual ChemComm Emerging Investigator Lectureship recognises emerging scientists in the early stages of their independent academic career. Nominations for the 2018 Emerging Investigator Lectureship will open later in the year – keep an eye on the blog for details, and read more about our previous winners. Also of interest: You can read the 2016 ChemComm Emerging Investigators Issue which highlights research from outstanding up-and-coming scientists and watch out for our 2017 Emerging Investigators issue – coming very soon. You can also take a look at our previous Emerging Investigator issues in 2011, 2012, 2013, 2014 and 2015. You asked, we listened. And now we invite you to join us as we explore a different approach to peer review. Single-blind peer review – where reviewers are anonymous but author names and affiliations are known to reviewers. Double-blind peer review – where authors’ and reviewers’ identities are concealed from each other. The choice of which peer review model should be used for each manuscript will be completely up to authors. However, as an author, if you opt for the double-blind process you will need to anonymise your manuscript before submission, avoiding mention of any information that might give your identity away. Authors who choose this option will be responsible for ensuring their submission is anonymised; we have prepared a checklist to help you. As a reviewer for ChemComm, you may be invited to review a manuscript that has been anonymised. All communication with you regarding double-blind manuscripts will omit author and affiliation details. ChemComm has always used the traditional, single-blind peer review model favoured by most scientific journals, and we continue to trust in the effectiveness of this system. However, we have listened to feedback from some members of the chemical science community and we have seen the growing interest in double-blind peer review. Proponents of double-blind review suggest that it can reduce the impact of biases, both obvious and subtle, conscious or otherwise, on peer review. These biases could be based on gender, ethnicity, author affiliation, and so on. In response to this feedback from parts of our community, we decided to see for ourselves how ChemComm can offer authors the option of anonymity, and whether this is something that our community values. Because the evidence for the effectiveness of double-blind in reducing bias is not clear cut1, we will carry out a 12-month trial to gather our own evidence. We want to understand the true demand for double-blind review from our authors and, where possible, to measure any differences in the effectiveness of the peer review between the two approaches. So why not take part in our 12-month experiment – both single- and double-blind peer review options will be available for submissions to ChemComm from the 3rd of July. Authors need only select the double-blind option upon submission to choose this process. We value your feedback and, as part of the trial, we will be asking all authors and reviewers to complete a short survey about their experience – please do share your thoughts on peer review, whether single- or double-blind, with us. After the trial, we will share the results of our experiment with the community and use the evidence gathered to make a decision about using double-blind review in future. 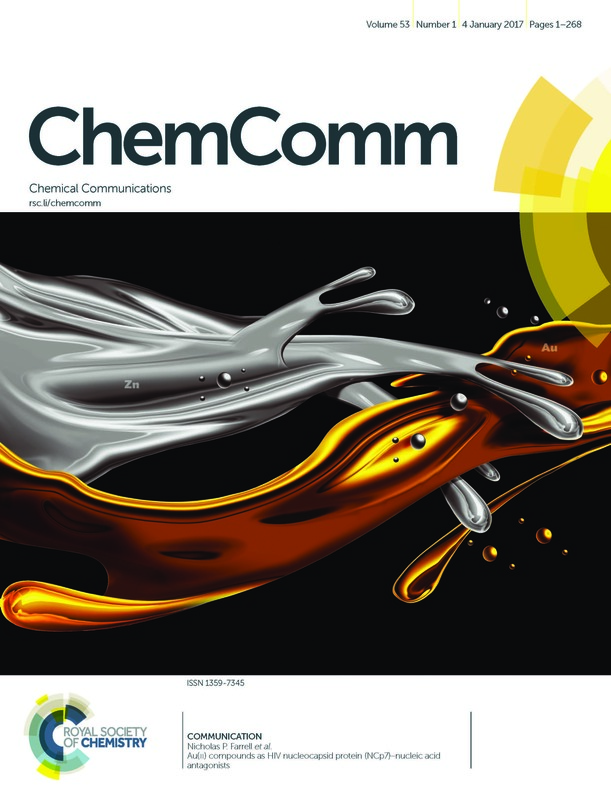 At ChemComm, we are proud to be the leading journal for urgent, high-quality communications from across the chemical sciences – publishing 100 issues a year. Read more about this trial in our guidelines for authors and reviewers. Journal lectureships 2017 – nominations open! We are pleased to welcome nominations for the 2017 Emerging Investigator Lectureships for ChemComm and Chem Soc Rev. All nominations must be received by Monday, 30 January 2017. Nominations are open for these journal lectureships – only one entry needed per nominee, as each nomination will be considered for both competitions as appropriate. • Recipients of these lectureships will each be invited to present a lecture at three different locations over a 12-month period, with at least one of these events taking place at an international conference. • Each recipient will receive a contribution of £1500 towards travel and accommodation costs for their lectures, as well as a certificate. • Recipients will be asked to contribute a review article for the specific journal awarding their lectureship. Self-nomination is not permitted. Nominators must send the following to the editorial team via chemcomm-rsc@rsc.org OR chemsocrev-rsc@rsc.org by Monday, 30 January 2017. Each nomination will be considered for both lectureships. • A one-page CV for the nominee, including their date of birth, summary of education, career and key achievements, a list of up to five of their top independent publications, total numbers of publications and patents, and other indicators of esteem, together with evidence of career independence. • Recipients of each lectureship will then be selected and endorsed by a selection panel composed of members of each journal’s Editorial Board. Winners of the lectureships will be announced in the first half of 2017. NB: Please note that members of the selection panel from the ChemComm and Chem Soc Rev Editorial Boards are not eligible to nominate, or provide references, for these lectureships. For any queries, please contact the editorial team at chemcomm-rsc@rsc.org or chemsocrev-rsc@rsc.org. On behalf of the ChemComm Editorial Board, we are delighted to announce Ang Li (organic synthesis and natural products), Shanghai Institute of Organic Chemistry, China, as the winner of the 2016 ChemComm Emerging Investigator Lectureship. Congratulations, Ang! Ang will commence his Lectureship tour at the upcoming International Conference on New Challenges in Organic Synthesis to be held in Guangzhou, China from 27-28 November 2016. This will be followed by a presentation at the 21st International Conference on Organic Synthesis (ICOS 21) at the IIT Bombay, Mumbai, India on 11-16 December 2016. His tour will culminate at the Royal Society of Chemistry’s 25th International Symposium: Synthesis in Organic Chemistry to be held at the University of Oxford, UK from 17-20 July 2017, during which he will be awarded with his official Lectureship certificate. We are pleased to welcome nominations for the 2017 Emerging Investigator Lectureships for ChemComm and for Chem Soc Rev – nominate now! Also of interest: You can now read the 2016 ChemComm Emerging Investigators Issue which highlights research from outstanding up-and-coming scientists. This year’s issue includes a selection of Feature articles and Communications, as well as a Profile of this year’s contributors, with interesting photos to spotlight our authors at work or at play – look out for a cool plasma ball, white-water rafting, a cute canine friend, and loads of lovely shots in the great outdoors! You can also take a look at our previous Emerging Investigator issues in 2011, 2012, 2013, 2014 and 2015. 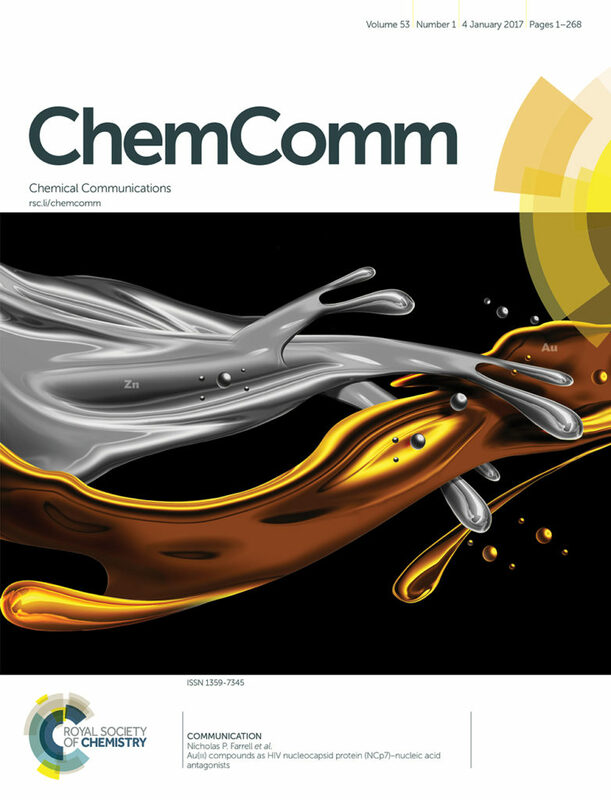 We are delighted to announce the publication of the 2016 ChemComm Emerging Investigators issue. Now on its sixth year, this annual special issue showcases internationally recognised, up-and-coming scientists who are making outstanding contributions to their respective fields. This year’s issue includes a selection of Feature articles and Communications, as well as a Profile of this year’s contributors, with interesting photos to spotlight our authors at work or at play – look out for a cool plasma ball, white-water rafting, a cute canine friend, and loads of lovely shots in the great outdoors! Researchers around the world cited ChemComm articles 175,661 times last year, making us the third most cited general chemistry journal, according to the latest citation data released by Thomson Reuters in its 2015 Journal Citation Reports®. With our Impact Factor riding high at 6.567 and our Immediacy Index at its highest-ever at 1.713, not only are your findings published rapidly in ChemComm, they’re also read and cited quickly by more and more researchers across all chemical science disciplines around the world – proof that we continue to publish urgent, high quality work on the very hottest topics. A massive thank you to everyone – our authors, referees, readers, Associate Editors, and Editorial and Advisory Board members – for contributing to the journal’s continued success. With more than 175,000 cites under our belt, we can’t help but think this an apt and fitting way of celebrating our 175 years in the service of the chemical science community as the oldest chemical society in the world. Submit your next urgent Communication to ChemComm, and quickly see the impact of your work across the breadth of the chemical sciences. *The Impact Factor provides an indication of the average number of citations per paper. Produced annually, Impact Factors are calculated by dividing the number of citations in a year, by the number of citeable articles published in the preceding two years. The journal Immediacy Index indicates how quickly articles in a journal are cited, and is calculated by dividing the number of citations to articles published in a given year by the number of articles published in that year. Data based on 2015 Journal Citation Reports®, (Thomson Reuters, 2016). ChemComm is delighted to announce Professor Véronique Gouverneur as its new Editorial Board Chair. Véronique Gouverneur, who is Professor of Chemistry at the University of Oxford, leads a dynamic research group and holds a tutorial fellowship in organic chemistry at Merton College Oxford. She has been internationally recognised for her outstanding and original work in fluorine chemistry, and has recently been awarded the Tetrahedron Chair for 2016. She was also the Blaise Pascal Chair from 2012 to 2014, and is currently holding a Royal Society Wolfson Research Merit Award (2013-2018). Her research aims to develop new approaches to address long-standing problems in the synthesis of fluorinated analogues of natural products, pharmaceutical drugs and molecular [18F] labelled probes for PET imaging. Véronique takes on the role from Professor Richard R. Schrock, our previous Chair, to whom we remain extremely grateful for his vision and leadership for ChemComm, throughout a period of exceptional development and continued success for the journal. As he now passes the baton, we look forward to working with Véronique towards an even more exciting and dynamic future for ChemComm. A very warm welcome to Véronique from all of us here at ChemComm! Methylation followed by fluorination of the ethano-Tröger’s base affords a novel N–F reagent more reactive than Selectfluor bis(tetrafluoroborate). This study provides 1JFN coupling constants to characterize the N–F group. Journal lectureships 2016 – nominations open! We are pleased to welcome nominations for the 2016 lectureships for ChemComm, Chem Soc Rev, and Chemical Science – the Royal Society of Chemistry’s flagship general chemistry journals. All nominations must be received by Friday, 15 January 2016. Nominations are open for the following journal lectureships – only one entry needed per nominee, as each nomination will be considered for all three competitions as appropriate. •	Recognises sustained excellence in research by a mid-career scientist within the chemical sciences. Previous recipients of this lectureship include Kevan Shokat (UC San Francisco; 2013), Gregory Fu (Caltech; 2014) and Yamuna Krishnan (University of Chicago; 2015). •	Recipients of these lectureships will each be invited to present a lecture at three different locations over a 12-month period, with at least one of these events taking place at an international conference. Note: As part of this series of winners’ lectures, the Chemical Science Lectureship recipient will be invited to give a plenary lecture at a relevant ISACS (International Symposia on Advancing the Chemical Sciences) meeting. •	Each recipient will receive a contribution of £1500 towards travel and accommodation costs for their lectures, as well as a certificate. •	Recipients will be asked to contribute a review article for the specific journal awarding their lectureship. Self-nomination is not permitted. Nominators must send the following to the editorial team via chemcomm-rsc@rsc.org by Friday, 15 January 2016. Each nomination will be considered for all appropriate lectureships. •	Recommendation letter, including the name, contact details and website URL of the nominee. •	A one-page CV for the nominee, including their date of birth, summary of education, career and key achievements, a list of up to five of their top independent publications, total numbers of publications and patents, and other indicators of esteem (and evidence of independence for nominees eligible for the emerging investigator lectureships). •	A copy of the candidate’s best publication to date (as judged by the nominator). •	Two supporting letters of recommendation from two independent referees. These should not be someone from the same institution or the candidate’s post doc or PhD supervisor. •	The editorial team will screen each nomination for eligibility and draw up a shortlist of candidates based on the nomination documents provided. •	Shortlisted candidates will be asked to provide a brief supporting statement summarising their key achievements, highlighting the impact of their work and justifying why they deserve the specific lectureship for which they have been entered. •	Recipients of each lectureship will then be selected and endorsed by a joint selection panel composed of members of each journal’s Editorial Board. Winners of the lectureships will be announced in spring 2016. NB: Please note that members of the selection panel from the ChemComm, Chem Soc Rev and Chemical Science Editorial Boards are not eligible to nominate, provide references for or be nominated for these lectureships. The International Committee of the International Symposium on Macrocyclic and Supramolecular Chemistry is pleased to invite nominations for the Cram Lehn Pedersen Prize for young supramolecular chemists. The Cram Lehn Pedersen Prize, named in honour of the winners of the 1987 Nobel Prize in Chemistry, recognises significant original and independent work in supramolecular chemistry. Previous winners include Feihe Huang, Oren Schermann, Tomoki Ogoshi, Jonathan Nitschke, and Amar Flood. Those who are within 10 years of receiving their PhD on 31st December 2015 are eligible for the 2016 award. The winner will receive a prize of £2000 and free registration for the ISMSC meeting in Seoul, Korea. In addition to giving a lecture at ISMSC, a short lecture tour will be organised after the meeting in consultation with the Editor of Chemical Communications, the sponsor of the award. You may nominate yourself or someone else. Please send your CV, list of publications (divided into publications from your PhD and post-doc, and those from your independent work), and if desired, a letter of support, or these materials for someone you wish to nominate, to Prof. Roger Harrison (ISMSC Secretary) at rgharris@chem.byu.edu by 31st January 2016. 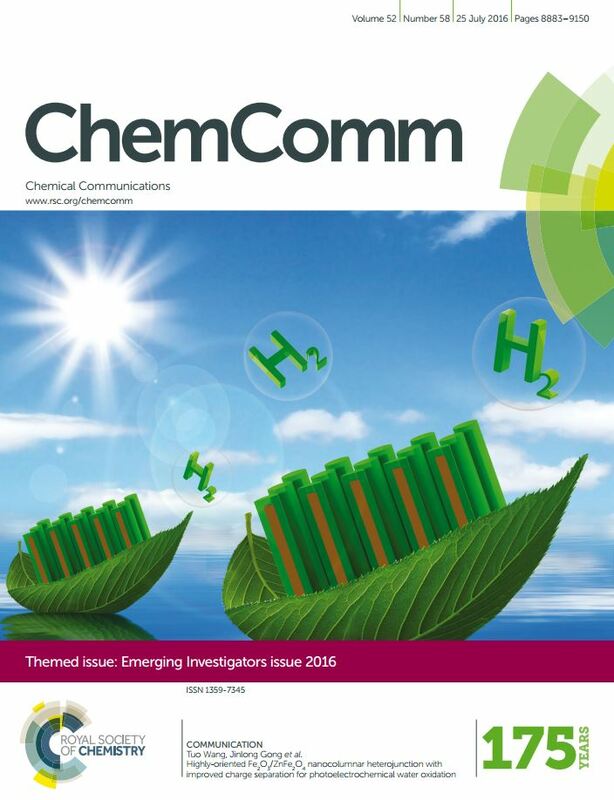 We are delighted to announce the forthcoming 2016 ChemComm Emerging Investigators issue. This special issue, now in its sixth year, will showcase the high quality research being carried out by international researchers in the early stages of their independent careers. If you are interested in submitting to the issue please contact the ChemComm Editorial Office in the first instance. Please note that authors must not have featured in a previous ChemComm Emerging Investigators issue. The deadline for submission is 18 January 2016.